'...Owners of the Reasonbanks Orange, Proton, and Analog Monsters libraries already know the quality that goes into these libraries, and Virology makes the perfect digital companion to these analog sample sets. About Peff: Kurt Kurasaki aka 'Peff' is a journalist, he is the author of Power Tools for Reason (a must have book to every REASON user!!!). You can read user testimonals below. If you're a VIROLOGY owner and you feel like writing a review, please do that, write! We will publish it on this page. Like: As the habit, all the patches and samples are great ! Grade: 4 points - Good work, recommended! Dislike: I bought this along w/ MATRIX... quite disappointed, much more impressed with MATRIX. all the sounds are quite similar and are lacking user friendly knob control... wished i would have gotten more variety out of it. on the other hand, MATRIX is great! i recommend that, buy that! About Paul: Home studio. Pro Tools 7.4 LE on an iMAC 24' with dual 2.33 processors. I also use Reason 4.0.1, Mach Five 2, Kore and many DSP plug-ins. I write and record contemorary Christian music and jazz. Like: I downloaded this product yesterday. It worked with absolutely no problems. The sounds were awesome. I have downloaded many other similar products and they have sounds that sound almost exactly like the factory sounds....and very few have their own character and cut through the mix. Grade: 5 points - excellent, highly recommended! Like: VIROLOGY is an exceptional ReFill. Not only does it sample one of the greatest sounding synths of all time and does a good job at it, they also expand the possibilities of regular sampling. Inside your Reason rack you can morph these high-quality samples in to just about anything. The ReFill contains presets to show you this but you will probably get the most out of it if you program sounds yourself, otherwise you will find the ammount of patches a little sparse since there are many variations of the same sound. 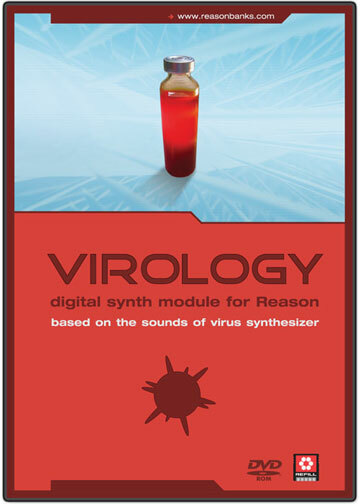 VIROLOGY's crisp, crunchy yet phat, warm and analogue sound is a great asset to any electronic musicians sound arsenal as well as any composer using Reason. Dislike: However, I would've liked if they included even more presets. Especially Combinators, since there's many who will rely on these and/or use these as bases to make new sounds. Maybe in a future add-on refill? Like: the Best Customer Service Anywhere! Dislike: Too many variations of a few great sounds in virology! I would prefer six different sounds rather than six versions of one great sound. Like: This is perhaps one of the most inspiring ReFills I own. I am a "recreational Reason" user and am always looking for new sounds to inspire me. I own Analogue Monsters Vol X and Analog Night so know the quality of Reason Banks ReFills. I am not able to justify buying the Access Virus that I want so decided to do the next best thing. I purchased this plug in and started browsing around the sounds to see what was available. I was absolutely AMAZED at all of the sounds offered in this ReFill. I have been trying to create sounds that are more organic and flowing to add depth to my songs. Exploring this ReFill was like the experience of using the Combinator for the first time X 2. If a friend owned Reason, this is the first ReFill I would recommend they buy. Like: Combinators are great. Strong basses, leads, drums, and a few nice pads. Dislike: I felt that the pads were lacking after previous experience with a real virus b/c. When I played the pads it was the most amazing ambient experience ever, but that magic was not there in this refill. There are still good pads and options to create your own though. Dislike: I would have liked the raw waves to be longer (e.g. maybe a few seconds in length) before looping. Also I would have liked the samples to be 24 bit. Like: Sonically, it's magnificent - quality sounds that are instantly recognisable as a Virus. I had to sell my Virus-A synth when I upgraded to an all-software studio set-up, so it's great to be able to reaquaint myself with those harsh basses, soaring leads and bubbbling arpeggios within Reason. This Refill can throw out some extremely powerful sounds - some of the basses in the NNXT Complex patch set are truly amazing. It's all impressive stuff - alongside the NNXT Complex patches, the Dr.Rex loops and Combinator patches particularly shine. In all, the Virology is a great refill and it's also fantastic value for money - I'm very pleased with it..
Dislike: Dislike? Not much really, although there could maybe have been some documentation (patch lists, etc)included with the disc itself. Like: If you are serious about your synths in Reason. Virology is a must and a bargain. Many thank to Andras and the team at Pinknoise studio. Like: Way to much to say about this killer sample library. All refill's should be made REASON BANK style when you get it you get it . I wish there was more leads (but I know there will be an add-on soon !!! THIS IS NOT A DISLIKE !!!!!!!!! Dislike: I wish I had more time to make music !